The Warrant No.201 was granted to Nenagh on the 3rd April 1846, at which stage it adopted the name "Ormonde". Ormonde Lodge is still known as the Nenagh Lodge and is listed as such in the Annual Calendar and Directory issued by Grand Lodge. The Warrant was granted to Richard Lewis, who became the Lodge's first Worshipful Master, Michael Harty, who was probably the Senior Warden and William David Patterson as the Junior Warden. Some of the other members of the Lodge at that time were James Dempster, Provincial Deputy Grand Master of North Munster, J.C. Dempster, Charles Kempstone, John Burr Fletcher (see below), J F MaGrath and William B Fry. Most of these Brethren were prominent businessmen, or owned land or properties in the Nenagh area. Rice Lewis was a prominent personage in Nenagh and owned extensive lands and properties, and Michael Harty an apothecary (a chemist), owned extensive properties. In 1849 his property in Smithville was rented as an Auxiliary Workhouse to house 300 paupers. It was later used to house and school 400 boys. James Dempster, M.D. was an ex-Army Surgeon, appointed as a Commissioner in 1839 for the erection of the new Courthouse and gaol. However, in May 1945, Lodge 201, which was by then largely composed of Limerick Brethren and probably because of travelling difficulties due to the effects of the Second World War, moved its meeting place from Nenagh to Limerick where it has remained ever since. Seven members served in the 1914-18 War, with FW MacKay making the supreme sacrifice. Lodge No. 288, 1757 - 1822. Lodge No. 70, 1806 � 1830. Lodge 208, 1841 - 1856. OTHER PLACES ASSOCIATED WITH WARRANT No.201. Sporthall in Co. Monaghan: 1749 - 1758. Cootehill, Co. Cavan: 1758 - 1771. Revived 1st March 1810 and cancelled again on the 7th September 1843. In St Mary�s Church, Nenagh is a Memorial Tablet to John Burr Fletcher, M.D. which was erected by the Brethren of both Lodges 201 and 208. The Tablet is in the form of a Masonic Apron with the emblems, (the V.S.L., the Hourglass, the Square and the Compasses) on the flap of the apron. By 1985 the Memorial had fallen into disrepair, and in that year was restored by Lodge 201. THIS TABLET HAS BEEN ERECTED BY THE BRETHREN OF THE MASONIC LODGES 201 AND 208 NENAGH. 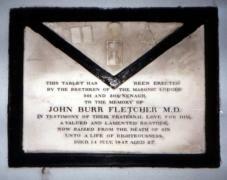 TO THE MEMORY OF JOHN BURR FLETCHER M.D. IN TESTIMONY OF THEIR FRATERNAL LOVE FOR HIM, A VALUED AND LAMENTED BROTHER, NOW RAISED FROM THE DEATH OF SIN UNTO A LIFE OF RIGHTEOUSNESS. DIED 14 JULY 1847. AGED 27.